﻿Rental payments can be made in person, mailed or paid online 24 hours a day 7 days a week! Our office is staffed from 9am-5pm Monday - Saturday. For your convenience, Riviera has a drop box at the front door for after-hour payments 24 hours a day 7 days a week. 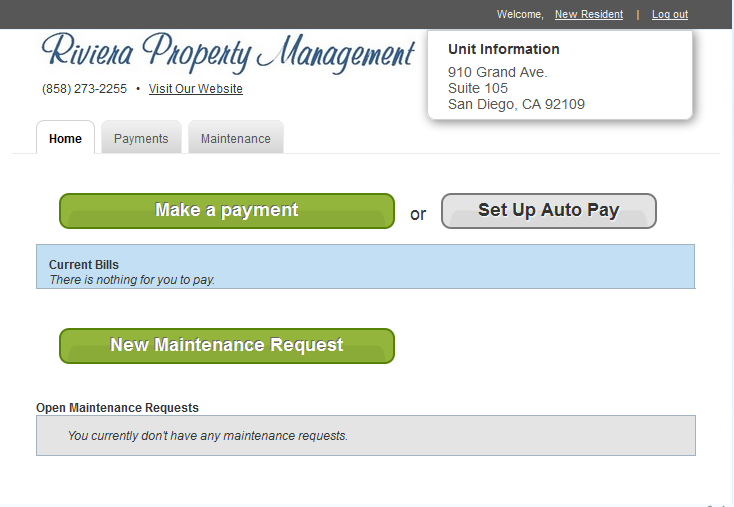 Riviera also offers online payments to make paying rent as quick and easy as possible! This is the preferred payment method of most of our residents. No more worries about forgetting, being out of town, the office being closed, running out of checks etc! You'll even get a confirmation email letting you know your payment has been received! In less than 2 minutes you can set up automatic monthly payments! Just give us a call and we'll email you an invitation to set up online payments! It's simple! See the easy steps below! 2. Choose to "Make a payment" or "Set up auto pay"
"Set up auto pay". This authorizes your bank to make recurring payments on your behalf each month to Riviera from your checking or savings account. There is "no fee" for this service when using e-check and you will receive an email each month letting you know that your rent payment has been made! Should you have a service need, new maintenance requests can also be made from this page. 3. Fill out the info below and click "Create Auto Pay"
Be sure to check your email each month for confirmation that your payment has been received. This email is proof of payment. Please Note: After the 5th of the month, rent is considered late. Online payments and personal checks will NOT be accepted, NO exceptions. Resident agrees to pay full amount of rent due plus a service fee of 6% of the current rent. Payment for late rent or bounced checks must be made in the form of Cashiers Check or Money Order.